Durnford Smith was born in Quebec in 1912. He received a degree in mathematics and physics from McGill University and, later, a master’s degree for his work in radioactivity. 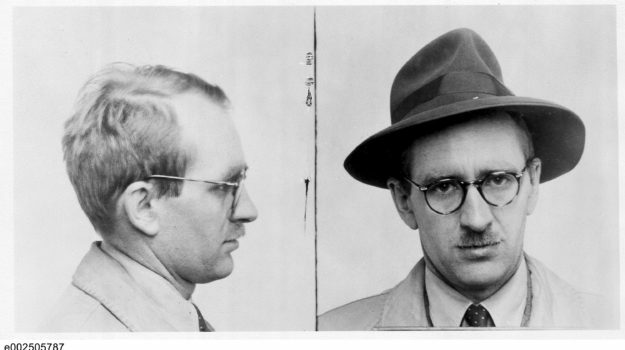 When he was arrested in February 1946, Smith was employed with the National Research Council as an assistant research engineer. Of the three members in Gordon Lunan’s study group, Smith was accused by the espionage commission of passing on the most information. He continually demanded to see a lawyer, and when he eventually testified before the commission, most of his answers were limited to “yes,” “no,” and “I do not recall.” Found guilty at trial, he was sentenced to five years in prison. “Durnford Smith was born in Westmount, P.Q., on 17th February, 1912, of Canadian parents. At the times in question he was a member of the Micro-wave Section of the Radio Branch of the National Research Council. He is a graduate of McGill University in mathematics and physics, and holds his Master’s degree obtained for work in connection with radio-activity. Before entering the employ of the National Research Council, he had been with the Bell Telephone Company in Montreal for five years. In 1936 he applied for a post in the National Research Council, but not until 1942 was he successful in obtaining a temporary position as Junior Research Engineer in the Radio Laboratory. Later he was engaged as Assistant Research Engineer. Smith’s work in the Council was secret, and on his appointment he took the usual oath of secrecy. In the course of his duties he had to travel quite frequently on behalf of the branch in which he was working. On various occasions he went to Toronto in connection with work that was being done by Research Enterprises Limited, and also to the Massachusetts Institute of Technology for the purpose of discussing secret equipment.